Panic disorders are defined by repeated panic attacks, which can occur in many environments and produce overwhelming and frightening symptoms of anxiety. Panic disorder sufferers usually make an enormous effort to avoid situations that might trigger panic attacks, but the only realistic and practical solution for panic disorder is comprehensive treatment, which will include a combination of therapy, medication, and complementary mind-body wellness practices. A panic disorder causes sudden and unexpected attacks of severe anxiety, accompanied by an array of disabling, uncontrollable physical symptoms. These attacks peak quickly, are highly intense, and may not subside until the sufferer is able to return home or to another familiar environment. An individual’s first panic disorder is confusing, frightening, and bewildering, since the extreme anxiety and powerful physical symptoms it produces will seem to come from out of the blue. Anticipating future attacks, panic disorder sufferers will make a great effort to avoid exposure to potential triggers. But this strategy seldom works for long, as panic symptoms tend to occur in a broad and ever-expanding range of contexts. The symptoms of panic disorder usually manifest for the first time in early adulthood, and may recede in frequency and intensity as a person ages. But if left untreated, panic disorder is a life-altering condition that dramatically affects the ability of sufferers to work, attend school, maintain relationships, or manage their daily affairs. Panic disorder is diagnosed in one of two forms, either with or without agoraphobia. Agoraphobia is an intense fear of unfamiliar places and unpredictable environments. It is such a serious condition that sufferers are often unable to leave their homes without experiencing panic symptoms, and they may choose to stay inside continuously to protect themselves from their anxiety. Panic attacks are a frequent cause of agoraphobia, and when panic disorder with agoraphobia develops (as it will between one-third and one-half the time), it means the fear of panic attacks has taken over an individual’s life. Panic disorder without agoraphobia is a less severe form of the disorder. But its symptoms are persistent and powerful, and people who suffer from panic disorder without agoraphobia will still go to extraordinary lengths to avoid situations that might trigger a panic attack. Unexpected (uncued). These panic attacks are not attached to any particular trigger or preoccupation, but instead develop randomly and without warning. Situationally bound. The onset of severe panic is exclusively connected to circumstances or environments that triggered attacks in the past. Situationally predisposed. Attacks occur in association with specific types of exposures, but they occur only some of the time instead of all the time. In some instances, they may develop only after the triggering exposure has ended. Men and women with panic disorder may experience a mixture of these three types of attacks, or they may experience only one. Unexpected or uncued panic attacks are a strong predictor for the development of panic disorder with agoraphobia, since they leave sufferers unsure of when or where an attack may occur. Panic disorder is one of six types of anxiety disorder. People who suffer from other anxiety-related conditions may experience panic attacks as well, although they may or may not meet the diagnostic criteria for an actual panic disorder. Over any 12-month period, 2.7 percent of Americans aged 18 and over will suffer symptoms consistent with a panic disorder. 44.8 percent of panic disorders can be classified as severe, with agoraphobia present in most cases. Panic disorder prevalence peaks among those in the 45-59 age group, with a lifetime rate of incidence of 5.9 percent. Women are twice as likely to be diagnosed with a panic disorder as men. The average age of onset for panic disorders is 24. In any 12-month period, 59.1 percent of panic disorder sufferers will receive treatment for their conditions. Because their symptoms are so intense and frightening, panic attack sufferers are more likely to seek immediate medical services than those who suffer from other types of mental illness. But many will choose to visit a physician rather than a mental health specialist, and that can delay an accurate diagnosis. 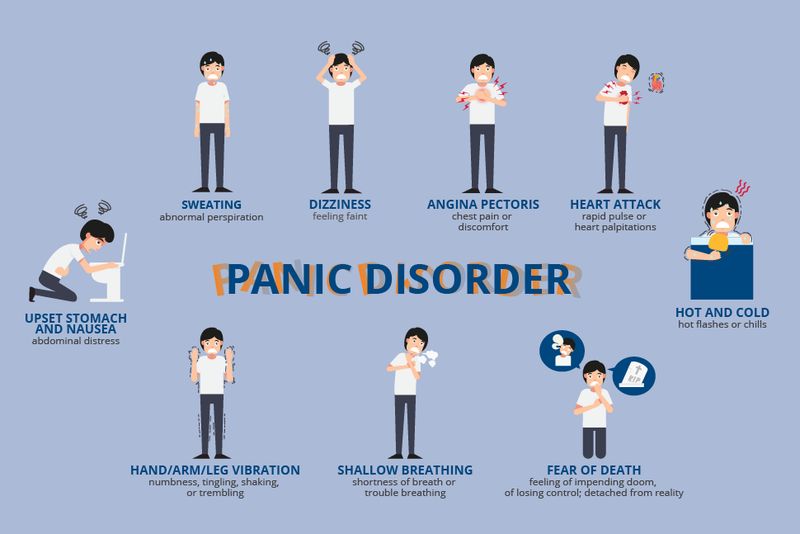 Panic disorder sufferers experience periodic and repeated panic attacks, and those attacks produce a variety of physical, psychological, and emotional symptoms indicative of severe anxiety. People undergoing their first panic attack may think they’re having a heart attack, since there are certain similarities in the symptoms. But with true panic disorder there is no underlying physiological cause that can explain the intensity of the anxiety sufferers experience. One panic attack followed by one month or more of severe concern over the possibility of another attack occurring, accompanied by behavioral changes designed to protect the patient from that possibility. Patients will also be assessed for agoraphobia, which may develop later if it isn’t present in the early stages of the disorder. Before a diagnosis can take place, patients must be evaluated to eliminate the possibility of medical conditions or other mental or behavioral health disorders (including a substance use disorder) that might explain the onset of severe anxiety symptoms. The onset of a panic disorder can likely be traced to a combination of genetic and environmental causes, plus learned, dysfunctional thinking patterns that encourage overanxious responses in general. Use of stimulants like caffeine, cocaine, ecstasy, etc. Panic disorder sufferers will try to avoid any situations they believe can precipitate panic attacks, although this strategy may prove ineffective over the long-term if new triggers develop. Many people who suffer from panic disorder also have other anxiety disorders (social anxiety disorder, obsessive-compulsive disorder (OCD), post-traumatic stress disorder (PTSD), generalized anxiety disorder, or specific phobias). Strong anxiety can easily push people over the edge into panic, and once a single panic episode is experienced others are highly likely to follow. 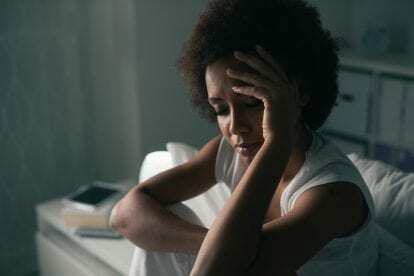 From a neurological perspective, depression is closely related to anxiety disorders, and therefore it is not surprising to find a relationship between panic disorder and clinical depression. Studies show that up to half of all panic disorder sufferers have experienced an episode of major depression at some point in their lives. As is the case with most psychiatric disorders, panic disorder increases the risk for drug and alcohol abuse. About 15 percent of men and women with an anxiety disorder of any type also suffer from a substance use disorder, which is about 40 percent higher than the national average. When co-occurring conditions are present alongside panic disorder, treatment must address all symptoms with equal focus and urgency. A dual diagnosis for more than one disorder requires comprehensive, integrated treatment if recovery is to be a realistic goal. Treatment for panic disorder will usually include a combination of talk therapy, medication, and holistic healing practices like massage therapy, hypnotherapy, yoga, meditation, acupuncture, biofeedback, and Tai Chi, which are highly effective against stress and anxiety. Panic disorder treatment plans often include extensive use of cognitive-behavioral therapy (CBT), which has a proven ability to diminish the symptoms of anxiety over time. In CBT, patients learn to identify and change unproductive thinking patterns that inevitably reinforce rather than defuse anxious responses. SSRIs. Antidepressants work well against anxiety, and drugs in this class of antidepressants are regularly prescribed for panic disorder sufferers. Specific medications approved for panic disorder include Prozac, Paxil, and Zoloft. SNRIs. An alternative antidepressant with proven anxiety-controlling capacities. The SNRI drug Effexor XR has been approved for use against panic symptoms. Benzodiazepines. These anti-anxiety medications are appropriate for short-term treatment of anxiety disorders (they can be addictive if taken for more than a few months). Benzodiazepines approved for the treatment of panic disorder include Xanax and Klonopin. While continuing care may be delivered through outpatient services, men and women with a fresh diagnosis for panic disorder are likely to benefit the most if they begin treatment in a residential mental health treatment facility. Inpatient treatment programs for panic disorder will feature daily, broad-ranging, all-inclusive individual and group therapy sessions, where patients receive valuable feedback from therapists and peers as they work to develop multiple strategies for managing panic symptoms (plus the symptoms of agoraphobia if present). Medication use will be carefully monitored to make sure results are positive and sustainable, and holistic healing practices will be offered as a complementary form of therapy. Panic disorder is an unpleasant and life-changing condition, but with continuing treatment long-term recovery is a realistic and achievable goal. At Bridges to Recovery, we specialize in diagnosing and treating complex psychiatric and emotional issues such as panic disorder. We provide compassionate and effective care in a serene residential setting so clients can focus on their treatment and recovery without the worries of external pressures and stressors. Private residential accommodations. Our exclusive residential treatment homes have a maximum of six clients, providing a safe, private alternative to a more traditional hospital environment. World-class clinical staff. Our expert clinical team provides individual therapy using proven evidence-based treatment modalities to treat panic disorder. Individualized treatment plans. After a thorough assessment, we create a truly individualized treatment plan that offers profound healing and strategies for overcoming the toughest obstacles. Health and wellness focused. To ensure your comfort during your healing process, our chefs create delicious healthy, gourmet meals. We also offer yoga, meditation, acupuncture, massage, and physical fitness classes. At Bridges to Recovery, we believe that exceptional psychiatric, clinical, and holistic care can transform lives. 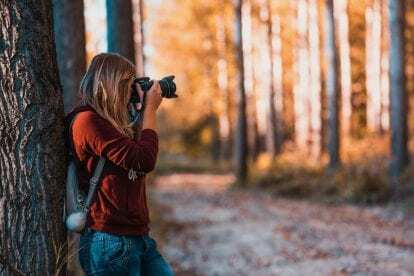 With the utmost dignity and respect, we meet you where you are to develop a vision for the life you wish to have, and offer the care you need to achieve it. What Are the Signs of Panic Disorder?